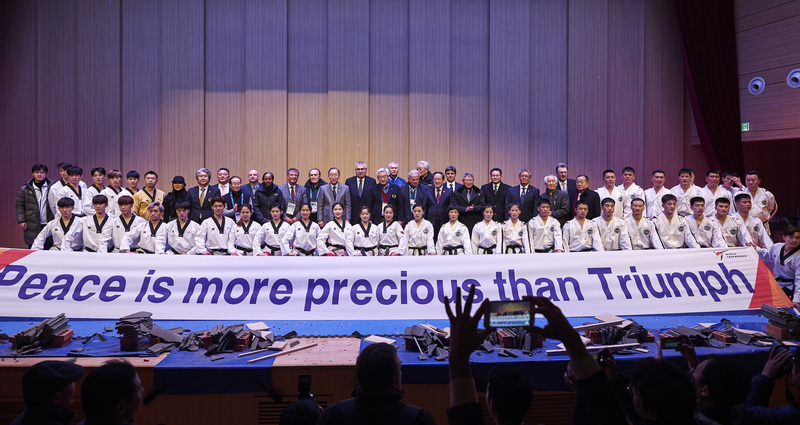 SOKCHO, Korea (Feb. 10, 2018) – Demonstration teams from World Taekwondo(WT) and International Taekwondo Federation(ITF) lit up the coastal city of Sokcho in Gangwon province in Korea’s northeast as they performed a joint demonstration the day after the PyeongChang 2018 Olympic Winter Games got underway. The demonstration took place at Gangwon Career Center, and was attended by enthusiastic locals and VIPs from the Olympic Movement including H.E. Mr. Ki-moon Ban, IOC Ethics Commission Chairman and Dr. Ugur Erdener, IOC Vice President, Mr. Francesco Ricci Bitti, ASOIF President, Mr. Ivan Dibos, IOC Member, Ms. Aicha Garad Ali, IOC Member, Prof. Ung Chang, IOC Member, Mr. Poul-Erik HØYER, IOC Member, Mr. Jean-Christophe Rolland, IOC Member. Dr. Hassan Moustafa, President, International Handball Federation, Mr. Oleg Matytsin, FISU President, Mr. Angelo Cito, WT Council Member. 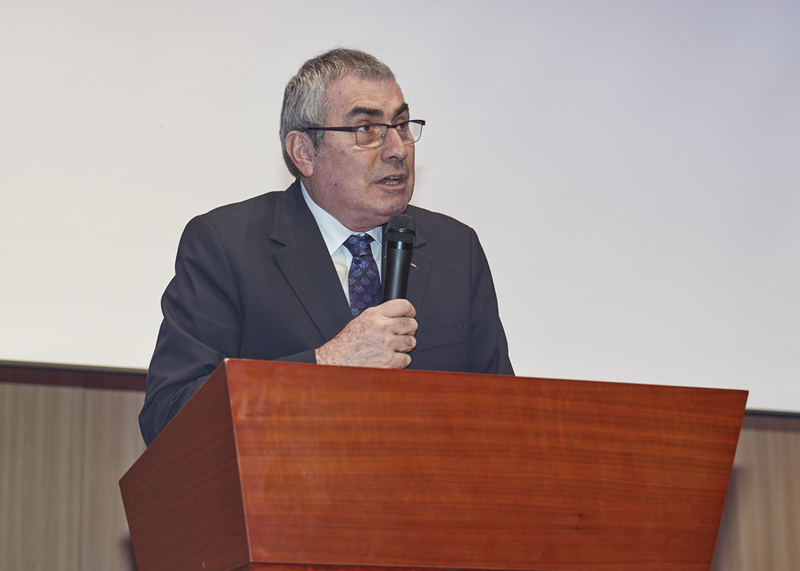 “This is the moment when we see the power of sports to unite people and countries,” said IOC Vice President Ugur Erdener. 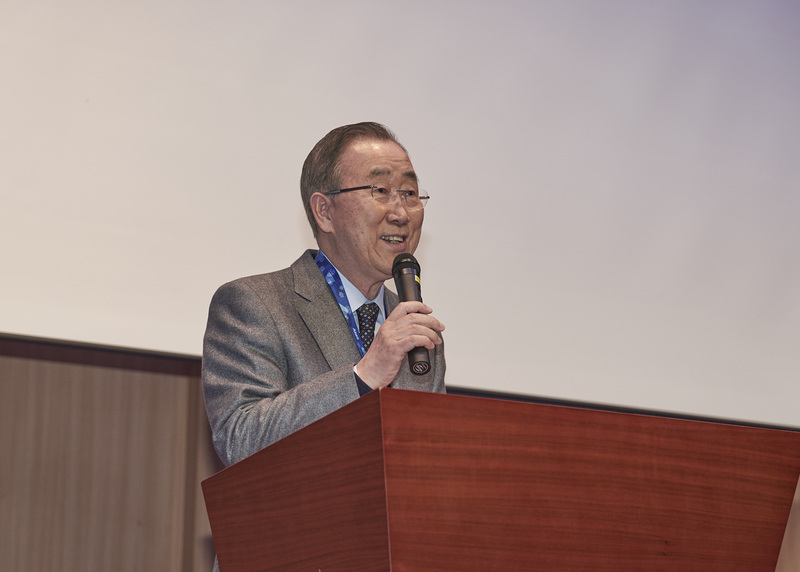 Prior to the performance, a welcoming ceremony was held by the city’s mayor at Sokcho City Hall. 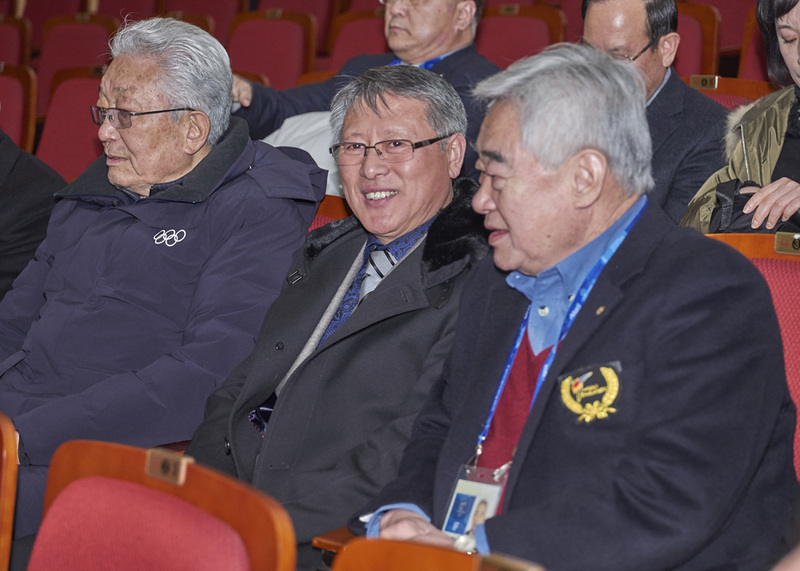 The ceremony was attended by senior WT officials including President Chungwon Choue and Secretary General Hoss Rafaty, as well as ITF President Yong Son Ri and ITF Vice President Hoyong Hwang. The performance, which lasted slightly over one hour, took on the format of a WT demo, an ITF demo, then a joint demo to wrap up the event. The WT demonstration started with a short film of recent humanitarian and social efforts. It included footage of nations struck by war and natural disasters, then showed work by WT and its charity affiliate, the Taekwondo Humanitarian Foundation, in earthquake-struck Italy and Nepal, and at the Azraq camp for Syrian refugees in Jordan. 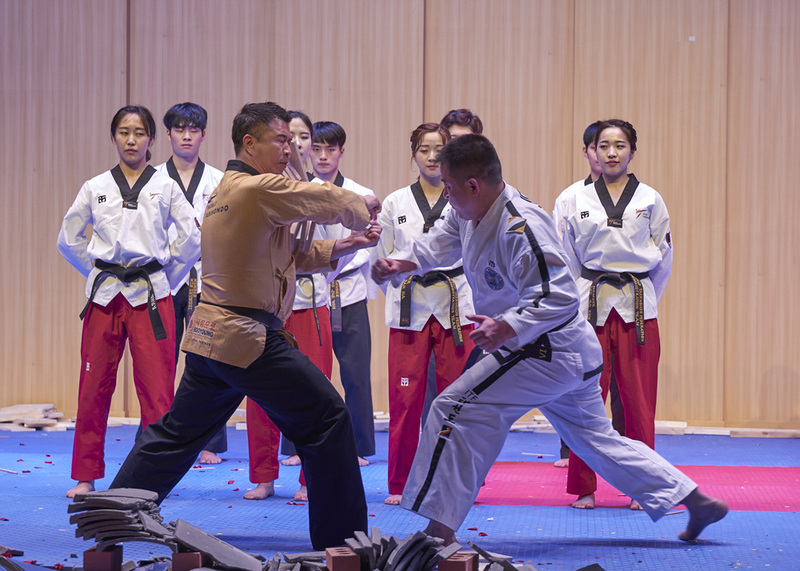 The film also included highlights of last year’s joint ITF-WT demonstration at the Muju 2017 World Taekwondo Championships, and the honorary black belt presentation ceremony made by Choue to the Pope at the Vatican. Then it was time for live action. 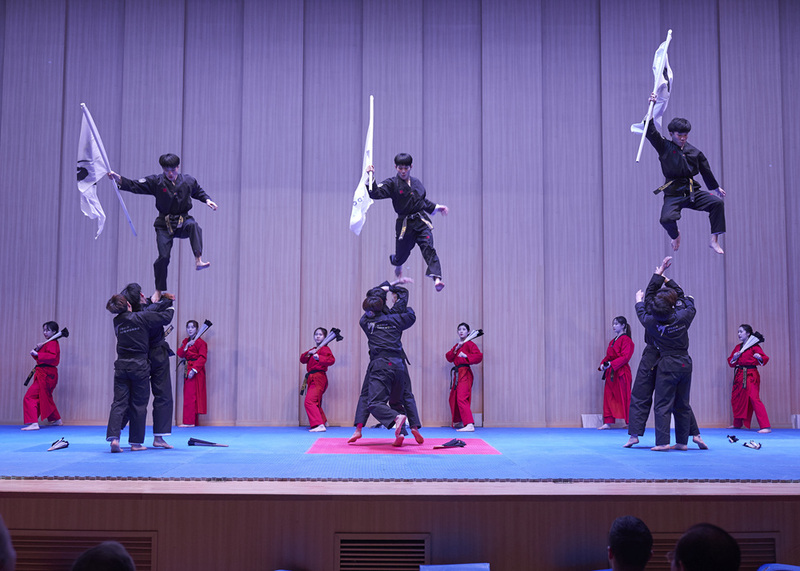 The performance started with a fan dance performed by players in red and black dobok, followed by group poomsae, using the fans as weapons. Next up were from the ITF. The ITF team marched on in traditional, all-white dobok. While the WT had used backing music, the ITF team were introduced over by a female MC at the microphone. 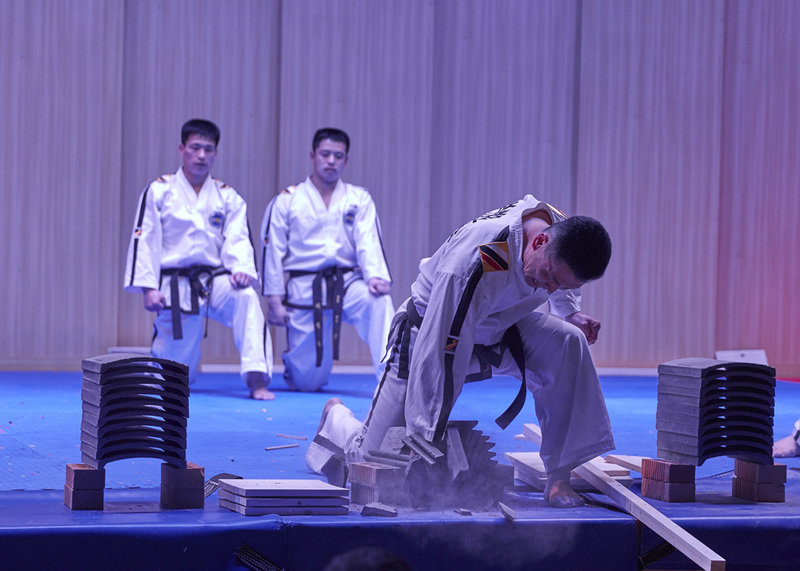 The demonstration started with some crisp poomsae that made the stage shake with the jumps and stamps. VIPs then mounted the stage – covered in splintered wood – for a photo opp and to congratulate the two teams. Then it was all over. The day’s performance followed a shorter program performed in PyeongChang just prior to the Winter Olympiad Opening Ceremony the day prior. The ITF and WT teams will perform two more demonstrations, in Seoul, before the ITF squad return home.